Tillerson announced the US was going to take one-third of Syria with a permanent force of 30,000 troops, mainly Kurds. A diplomatic secretary of state would act quietly, putting in place the troops and military bases before saying anything. Tillerson was also open in his calls for regime change in Venezuela and sloppily encouraged the president of Colombia to call the Venezuelan opposition while Tillerson was still in Colombia to tell them to back out of peace talks. He put US fingerprints all over that action. While we were hopeful about talks with North Korea, the likelihood of an end to hostilities with North Korea decreased with the appointment of Mike Pompeo. He is a hardliner who believes regime change in North Korea is more important than de-nuclearization of the Koreas. And, if he pushes Trump to back out of the Iran nuclear deal, which seems to be Trump’s preference anyway, why would North Korea agree to anything? The US does not keep its word. The US did not keep its word the last time the US and North Korea had an agreement, so what do they get but a likely broken promise? Trump will use the failure of the North Korean talks, if they occur, as an excuse for escalation. The only thing North Korea might get is time. If they can extend these negotiations long enough, maybe after 2020, things could get better, but the aggressive US policy toward North Korea has been bi-partisan, so this is likely a false hope. Escalation with Iran seems more likely now as Pompeo is extreme in his views on Iran, defining them (inaccurately) as the leading source of terrorism around the world. President Donald Trump’s appointment of Gina Haspel as deputy director of the CIA is the clearest sign yet that the president has come down on the side of those at the Agency who were the architects of the Bush-era torture policy. Haspel was a protégé of Jose Rodriguez, the CIA’s notorious former Counterterrorism Center (CTC) director and, according to The Washington Post and The New York Times, she was the chief of the secret prison where Abu Zubaydah and others were tortured. Furthermore, the Times reports, it was Haspel who ordered the destruction of video tapes showing the Abu Zubaydah torture sessions, on orders from Rodriguez. Torture is a crime under US and international law, and German prosecutors urged Haspel be prosecuted as a war criminal. Obstruction of justice and destroying evidence are felonies. Haspel should be prosecuted not given awards, career advancement or nomination as director of the CIA for her actions. The pro-torture contingent of the CIA has defeated those who opposed torture in the Bush era. Torture has been a tool of the CIA and has appeared in CIA manuals for decades. Haspel’s appointment is not surprising since Pompeo thinks torturers are patriots and Trump believes torture works. Trump put his generals in charge of military policy and now pro-torture CIA officials are in charge of foreign and intelligence policy. This is a bi-partisan failure. One of the early acts in the Obama administration was President Obama saying he would not prosecute torture that occurred during the Bush era with his infamous statement “we need to look forwards as opposed to looking backwards.” The failure to prosecute torture has resulted in a torture-criminal becoming the director of the CIA. If we had an opposition party these appointments would be an opportunity to put torture on trial, will they? Or will the Democrats show their complicity once again? Here’s a link to a discussion I participated in of the Tillerson firing and his replacement by Mike Pompeo and the appointment of Gina Haspel to the CIA from Loud and Clear head in Washington, DC. Back in December we asked, “Will CIA Director Mike Pompeo Replace Rex Tillerson As Secretary Of State?” The answer, as of moments ago, is yes. Moments ago, the WaPo first reported, and then President Trump tweeted, that he has ousted Secretary of State Rex Tillerson and replaced him with CIA Director Mike Pompeo, launching a major change to his national security team amid delicate negotiations with North Korea. Tillerson had learned his fate last Friday, according to the Washington Post, when Trump asked Tillerson to step aside, causing the embattled top diplomat cut short his trip to Africa on Monday to return to Washington, using illness as an alibi. Mike Pompeo will replace the former Exxon CEO at the State Department, while Gina Hapsel — the deputy director at the CIA — will Pompeo at the CIA, becoming the first woman to run the spy agency, if confirmed. According to WaPo, the president — who has long clashed will Tillerson, who he believes is “too establishment” in his thinking — felt it was important to make the change now, as he prepares for talks with North Korean leader Kim Jong Un, as well as upcoming trade negotiations, three White House officials said. Furthermore, it is worth noting that the Tillerson’s announcement comes just hours after the now former Secretary of State said that Russia is “clearly” behind the Skripal poisoning which “will trigger a response“, something he said when he already knew he was on the way out, prompting some to ask if this was an outburst meant to provoke Trump: after all Tillerson had nothing to lose at this point. 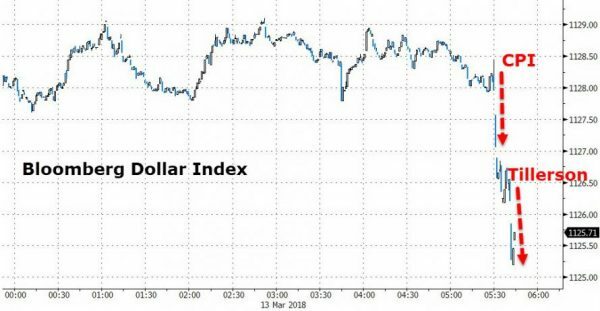 Finally, if it is Trump’s intention to keep crushing the dollar with every incremental announcement, he is succeeding. Mike Pompeo has issued the following brief statement sent to the press, saying he was “grateful” to have worked for the CIA. “I am deeply grateful to President Trump for permitting me to serve as Director of the Central Intelligence Agency and for this opportunity to serve as Secretary of State. His leadership has made America safer and I look forward to representing him and the American people to the rest of the world to further America’s prosperity. Serving alongside the great men and women of the CIA, the most dedicated and talented public servants I have encountered, has been one of the great honors of my life. I am proud of the work we have done on behalf of America and know that the Agency will continue to thrive under the leadership of Gina Haspel. CNN also notes that president Trump has wanted Mike Pompeo as his secretary of state for months now, and the White House began planning for him to take this job last fall. Trump’s anger at Tillerson after it leaked that he called him “a moron” never subsided, and many in the White House saw their differences as irreconcilable. Tillerson had few, if any, allies left in the West Wing. Though Chief of Staff John Kelly was initially on his side when he took over, he eventually grew weary of defending him — especially after the “moron” remark, which Kelly saw as insubordination on Tillerson’s part. Ultimately, according to sources close to the President “it was clear Tillerson didn’t support Trump.” They say Tillerson wanted to handle foreign policy his own way, without the President. Trump didn’t feel that Tillerson backed him, source says. President Trump tells reporters that he and Tillerson disagreed on Iran, that he made the North Korea decision himself and thinks Tillerson will be “much happier now.” Trump said “I wish Rex Tillerson well… I very much appreciate his commitment and his service and I wish him well. He’s a good man… We got along actually quite well but we disagreed on things. Trump also said he and the man he’s nominating to replace Rex Tillerson think the same way. “I am really at a point where we are getting close to having the cabinet and other things that I want,” Trump said. Trump told reporters moments ago that he and Tillerson “got along,” but they disagreed on key issues, like the Iran nuclear deal. Some more details on how Tillerson learned he was fired: A senior White House official has told CNN that President Trump asked Chief of Staff John Kelley to call Rex Tillerson on Friday night. The official said Kelly told Tillerson that he will be replaced but did not specify the timing. It was Trump’s decision to pull the trigger Tuesday morning, which underscored their fraught relations. “This is how the President wanted to do it,” the official said — a reflection of how the man who became famous saying “you’re fired” actually rarely does it in person. Steve Goldstein, State Department undersecretary of public affairs, confirmed that Tillerson got a call on Friday night from Kelly with a heads up, but Goldstein did not elaborate. Goldstein insists that Tillerson was notified of the official termination in the tweet this morning. Reporter: Did you fire him because he called you a moron? At that point Trump pivoted to Mike Pompeo. According to media reports, the Senate Foreign Relations Committee is expected to begin confirmation proceedings for Mike Pompeo in April, according to a statement from committee chairman Bob Corker. Pompeo is currently the Director of the CIA. He was confirmed to that position in January 2017 with a vote of 66 to 32. Meanwhile, Bob Corker, the chairman of the Senate Foreign Relations Committee, said he hasn’t had a chance to talk to Rex Tillerson today. He said he last spoke to the former Secretary of State last week, when the two discussed North Korea. Corker added that he has enjoyed working with Tillerson and has heard “good things” about Mike Pompeo, Trump’s pick to replace Tillerson. Of course they’ll be confirmed. Why, because if Dems vote in favor we’ll knock them out in November (or May?) I believe some have already voted for most of the other monsters. I Democrat voters start paying attention to the way “their representatives” vote on appointments and issues, and vote on that basis rather than on the basis of campaign ads, that would be a very welcome change.